the smalle rayne downe can rayne? Words and music from a Tudor part-book, used as the cantus firmus for a Mass by the sixteenth-century English composer John Taverner, organist of Christ Church, Oxford, and resident of Boston, Lincolnshire (two of my favourite places). Odd choice for a Mass, but that's the sixteenth century for you: crazy. 'Although other great and unheard-of wonders happened in this year , we have thought it worth our while to mention in this work one more remarkable than the rest. As it is the nature of the sea to vomit up on dry land the dead bodies thrown into it, about eleven whales, besides other marine monsters, were cast up on the seacoast of England, dead, as if they had been injured in some kind of struggle — not, however, by the attacks or skill of man. The sailors and old people, dwelling near the coast, who had seen the wonders of the deep when following their vocation in the vast waters, and trafficking to distant countries, declared that there had been an unusual battle amongst the fishes, beasts, and monsters of the deep, which by wounding and gnawing each other, had caused death to several; and those which had been killed had been cast ashore. [To Thetis' funeral came a monster fish. These days it would probably be attributed to global warming. Never thought I'd see the day when Gorm the Old got his name in The Sun... that's really quite freaky. I wonder where they got that wussy picture of Cnut, though. O God, from you that I could private be! And only absent when we are together. From my self you, or from your own self I. Here's something to make you want to cry. "The Church of England has voted to use more accessible language during baptisms to help it connect better with congregations, especially non church-goers. Members attending the Church’s General Synod, or parliament, in London, agreed that the Liturgical Commission should provide supplementary material to help prevent the eyes of worshippers “glazing over” during important parts of the service. The Reverend Tim Stratford, from Liverpool, said on Wednesday his motion was "not a request for christenings without Christianity." Quite the opposite. "I am not asking for the language of Steven Gerrard," he said, referring to the Liverpool and England soccer star. "Just references that could be understood by the majority." Through water you led the children of Israel from slavery in Egypt to freedom in the Promised Land. In it we are buried with Christ in his death. By it we share in his resurrection. Through it we are reborn by the Holy Spirit." even when presented in language which is so plain as to be almost banal? And the Church of England, instead of realising that maybe this shows how atrociously they have failed to educate the souls in their charge, decides to just take out the Biblical references? That may be one of the most patronising things I've ever heard. Generations of people with no formal education have learned the basics of the faith well enough to understand the baptism service - and today's Christians aren't even to be expected to try. Modern Christians are too stupid to understand the symbolism of baptism, so we should just pretend there isn't any (while at the same time making snobbish jokes about the Scouse dialect, of course). This, right here, is why the Church of England is dying. You hear a lot of drivel from Anglican vicars about how paternalistic their Victorian forebears were, but no Victorian clergyman would have ever been so elitist and patronising as to think his flock should not be expected to understand just a little of the Biblical basis for baptism! And as for the medieval era (you know, that time when no one knew the Bible, because the nasty clergy hid it from them?) - well, illiterate tradesmen put on plays about the story of Moses and Pharoah, a story which is today supposed to be beyond the comprehension of ordinary Christians. Never mind, it gave Rowan Williams an opportunity to make a self-deprecating joke: "I find myself very much in sympathy with this motion. Like most of those who have spoken, I too, have a sense of the wordiness of what we have and a slight feeling of eyes glazing over. It is not, I think, solely as a result of my delivery." St Anselm would be so proud. 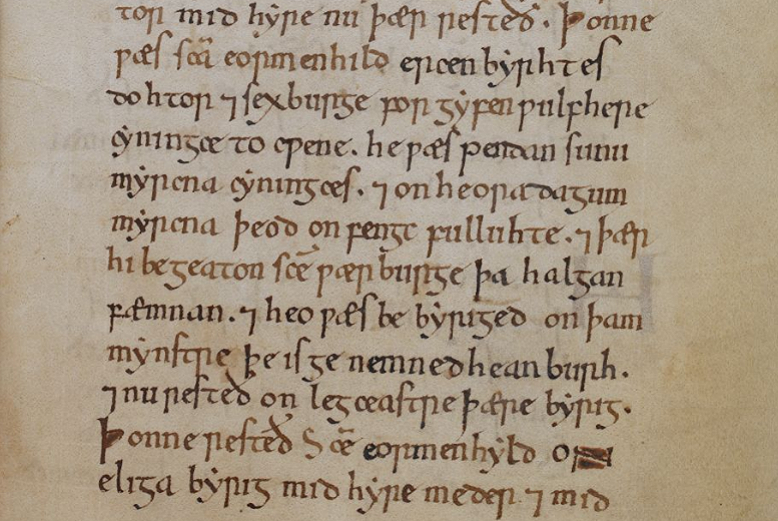 This is "apparently the earliest reference to the customary local mode of execution called ‘infalisation’, according to which felons were thrown from a cliff called Sharpeness at Dover" (William of Malmesbury, Gesta Pontificum Anglorum, ed. and trans. Michael Winterbottom, vol.II, p.33). O God, who knowest us to be set in the midst of so many and great dangers, that by reason of the frailty of our nature we cannot always stand upright; Grant to us such strength and protection, as may support us in all dangers, and carry us through all temptations; through Jesus Christ our Lord. 1014: 'After many cruel atrocities, which he perpetrated both in England and in other lands, the tyrant Swein filled up the measure of his damnation by daring to demand enormous tribute from the town where the incorrupt body of the precious martyr Edmund lay, a thing no one had dared to do before... He very frequently threatened that if it were not speedily paid he would destroy utterly the martyr's church, and he would torture the clergy in various ways. In addition, he frequently disparaged the martyr himself in many ways - he dared to say that he had no sanctity - and, because there were no bounds to his malice, divine vengeance did not allow the blasphemer to live any longer. John of Worcester, trans. Jennifer Bray and P. McGurk, p.477. Poor Svein! I mean, I know St Edmund was brutally murdered by Vikings, but this seems a bit harsh. 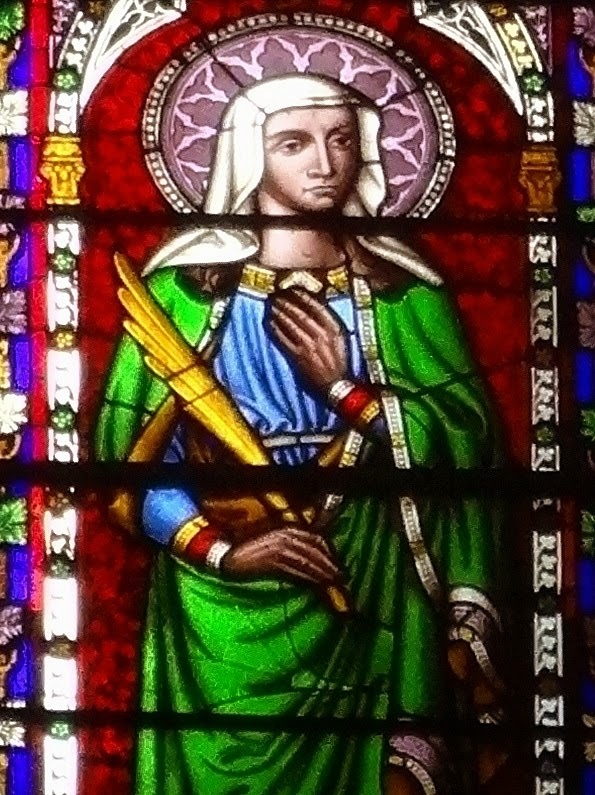 St Werburg lies at Chester, about whom, among the many things said of her, one is outstanding and unheard of, which I cannot avoid mentioning. For it is written that a large flock of wild geese were destroying her growing corn by feeding on it: she had them confined in a certain house, as if they were domestic geese. In the morning, when she called them, ready to send them out, she saw that one was missing. On enquiry, she heard that it had been eaten by the servants. "Bring me," she said, "the feathers and bones of the bird that has been eaten." When they were brought to her, this bride of the high God commanded that it should be whole and should live. And it was done. Then she instructed the geese, which were cheering and crying out at the return of their lost companion, that no other of their kind must ever, in all eternity, enter that field. They all departed in safety. And what the virgin commanded has been observed up to the present day. Henry of Huntingdon, Historia Anglorum, trans. Diana Greenway (Oxford, 2002), pp.693-5. This story always reminds me of Thor and his goats, but it's a not uncommon form of saintly power. Werburh's distant cousin St Mildrid is also associated with geese, and other Anglo-Saxon saints who had a particular way with birds (though not with resurrecting them, as far as I know) include St Hilda (reverenced by the sea-birds of Whitby),St Cuthbert (fond of Eider ducks) and St Oswald (had a pet raven). This post features a combination of two favourite themes of this blog: Christmas carols, and King Cnut. But it also celebrates Candlemas. Let me explain. A few weeks ago I posted about a story of Cnut's visit to Ely Abbey, where the king had to follow a peasant across the ice in a cart when the fens proved impassable by boat. According to the twelfth-century history of the abbey, Cnut was in the habit of visiting Ely to celebrate the Feast of the Purification, aka Candlemas, aka today. If you will go visiting Fenland abbeys in February, you get weather problems - but sometimes Cnut actually made it to Ely. And on one occasion he wrote a song about it! Well, not really. I mean, he probably didn't write it. 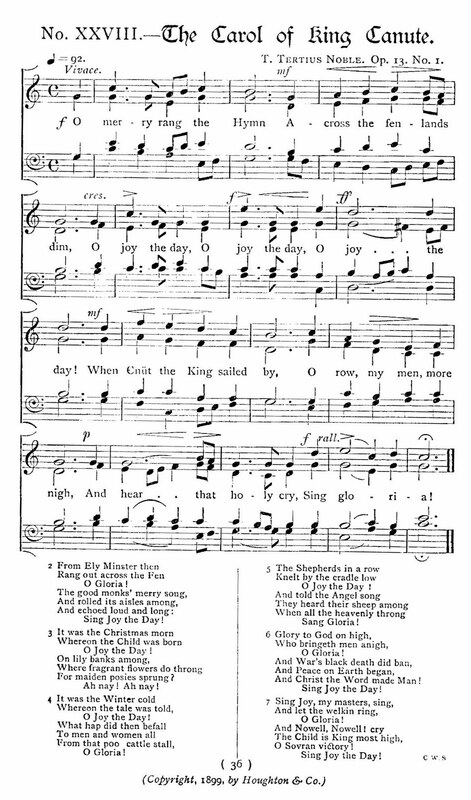 But there is a song, and it's one of the earliest songs in Middle English, and there's a lovely story about it. ða Cnut ching reu ðer by. 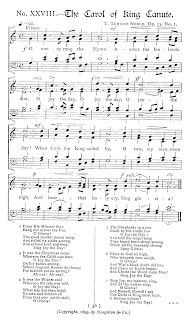 This and the remaining parts that follow are up to this day sung publicly by choirs and remembered in proverbs. 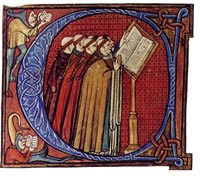 The king, while tossing this around [in his mind], did not rest from singing piously and decorously in concert with the venerable confraternity, until he reached land." 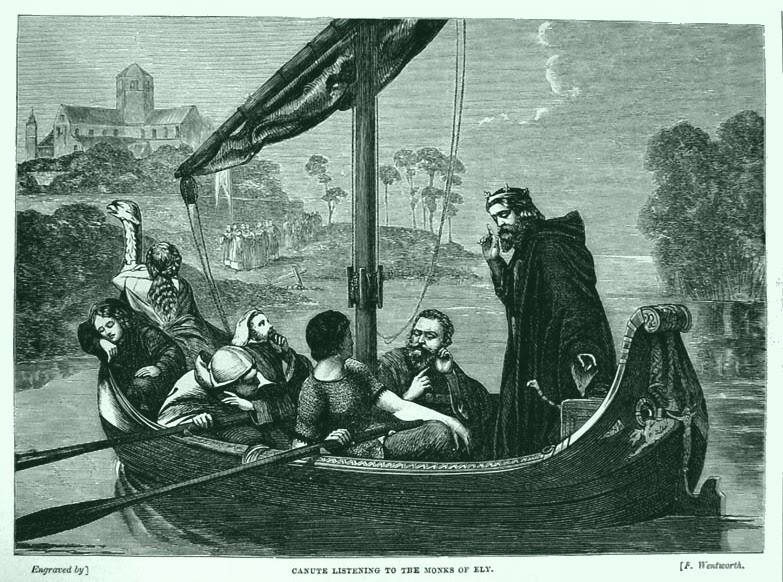 Liber Eliensis: A History of the Isle of Ely from the Seventh to the Twelfth Century, trans. Janet Fairweather (Woodbridge, 2005) pp.181-2. And since that happened at Candlemas I choose to think of 2 February additionally as 'Cnut Day' or 'The Anniversary of the First Middle English Carol' or whatever you like. And Christ the Word made man! You can listen to Benjamin Britten's lively setting of 'The Carol of King Cnut' here. This is my all-time favourite love poem, by Edwin Muir. But like yourself, as they were meant to be. My favourite bit of this passage, a fairly standard medieval interpretation of a metereological phenomenon, is the last line. "Oh, yes, the sky kept turning red, but we weren't that bothered when it happened a third time..."
This took place during Richard I's captivity in Austria, 1192-3; it was written by the Yorkshire chronicler William of Newburgh.